Free Joseon announced Friday that it has established a provisional government for North Korea in an effort to fight against the regime’s abuse of human rights. The group previously claimed it had protected the son of the late Kim Jong-nam, the half brother of North Korean leader Kim Jong-un, from possible assassination. Formerly known as Cheollima Civil Defense, the group said it will rise against the North Korean regime for committing crimes against humanity for decades. “We indict this immoral and illegitimate regime for the devastating starvation of millions, despite the ability to feed them; For government-sponsored murder, torture, and imprisonment; For overwhelming surveillance and thought-control,” the group said on its website. 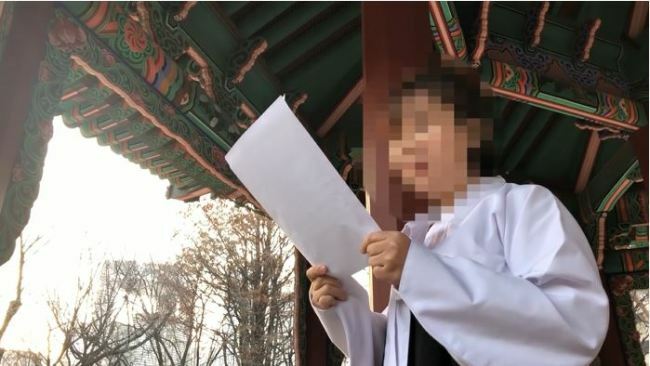 In an online note titled “Declaration for a Free Joseon,” the group attached a video clip featuring a women standing on a Korean traditional pavilion and reading aloud the same text from the site. It appears to have been filmed in South Korea. The announcement came as South Korea marks the 100th anniversary of the March 1 Independence Movement, which took place in 1919 calling for Korea’s liberation from Japanese colonial rule. Free Joseon called for North Korean diaspora around the world to join its revolution to defy oppressors and seek freedom. “We reject the chains of our historic unrequited grief, declare henceforth a new era in our history, and prepare the way for a New Joseon. We therefore proclaim the birth of our revolution and our intentions towards building a more just and equal society, as truest expressions of the shared affections of our people,” it said. The Joseon Kingdom lasted from 1392-1897, and “Joseon” is still used by North Koreans and Koreans living in China in referring to the peninsula. The group has not revealed details about itself, including the names of members or their locations, but it is believed to be a network helping North Korean defectors. In March 2017, Cheollima Civil Defense released a video of Kim Han-sol, saying that he was with his mother and sister following the assassination of his father, Kim Jong-nam. The half brother of Kim Jong-un was assassinated at a Malaysian airport two years ago.